The main goal of the house is to give shelter and protection from the environmental conditions. Materials used for construction and the look of a house was primarly determined by the local nature. In our region the primary construction material was wood and primary type was log house. We have no granaries remaining from the Iron Age. Ethnographic materials reveal that the granaries were built above ground to guarantee good ventilation and protect the building from the moisture emanating from the soil. This helped preserve food and clothes. The granaries had wooden floors. This building is the only one in the compound with a wooden floor. When a building like this is destroyed, it leaves no signs on the ground. The roof of the granary is made of reed. Other grassy plants may also have been used at the time. Fasciae were used on older reed and straw roofs. Turf was used to cover the gable. 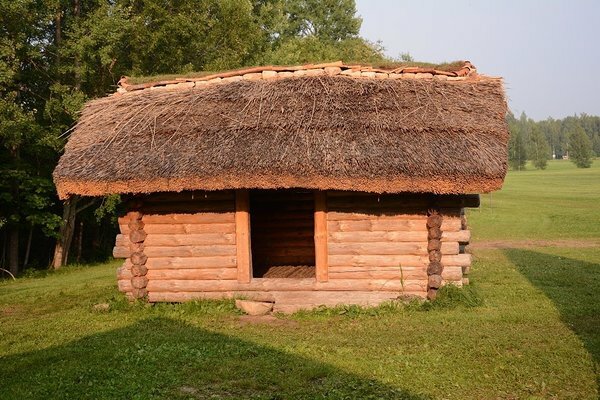 As turf roofs are among the oldest types of roof, it is possible that turf was also used on the gables of otherwise reed roofs. No such solution is evident from ethnographic materials.